Winter Adhesive can be used both for the basecoat reinforcement layer and for fixing EPS boards on to the substrate. The adhesive provides a water-proof, frost-proof and high-grip finish without being affected by lower temperatures during setting and application time. 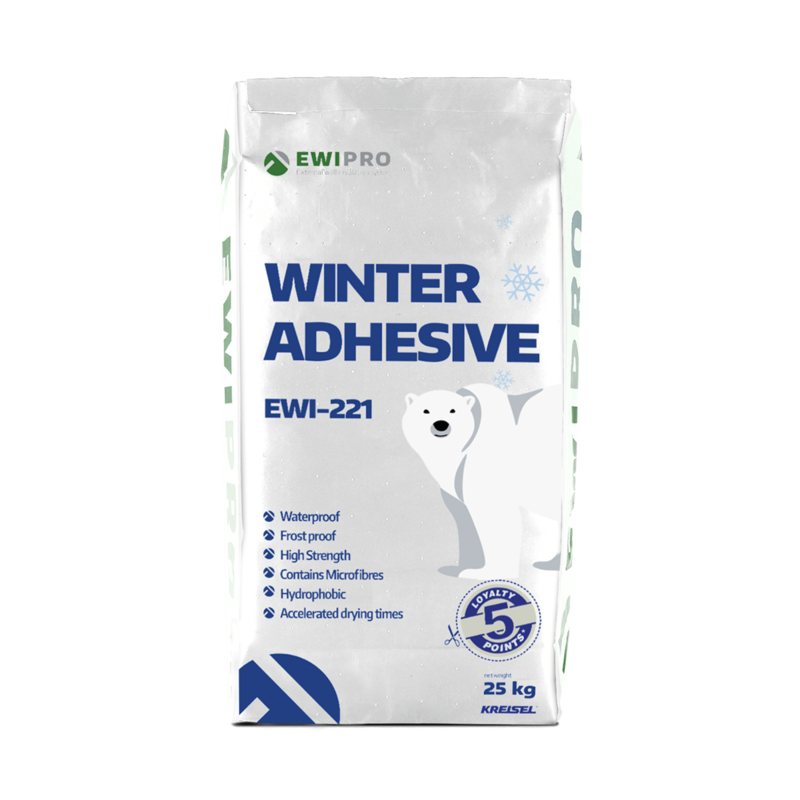 This is because the key difference between this adhesive and our other adhesives is that it can be used even at temperatures down to zero degrees. It is therefore suitable for use 365 days a year, allowing maximum efficiency and limiting the amount of time gone to waste due to poor weather. Much like the EWI-220 EPS Basecoat Adhesive, the Winter Adhesive has a dual purpose: it can be used both within the basecoat reinforcement layer, with a fibreglass mesh embedded, and for fixing EPS insulation boards to substrates. Winter Adhesive should not be used for fixing extruded polystyrene (XPS) and external insulation on bituminous substrates. The EWI-221 comes as a dry-mix adhesive, so it should be mixed with water before application to substrates. Winter Adhesive should not be applied in rain or humid conditions, or if wet weather is expected before the adhesive has set. While this adhesive is suitable for application in cold weather, it should not be applied if the materials or the substrate are frozen or if temperatures are lower than 0°C. Use protective covers to shield the adhesive against extremes of weather conditions during and at least 8 hours after application. EWI-221 should be mixed with approximately 5.3 litres of water per 25kg of dry mix.